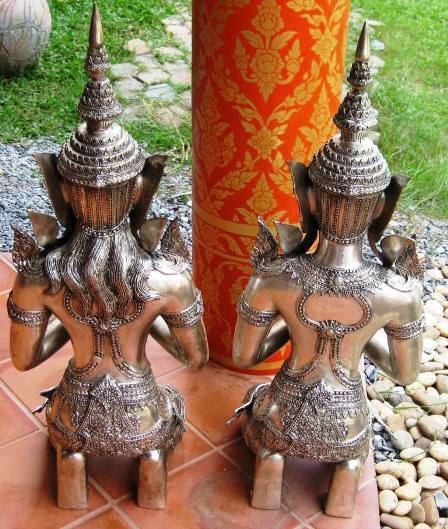 Silver Kneeling Teppanom Angels can also be purchased if brass doesn't suit your décor. The Teppanom Angels look stunning and come in a variety of sizes to suit any area of your home. The Teppanom is part of the Buddhist tradition and is commonly seen throughout Thailand as a gesture of welcoming people into their home or temple. Just like the brass and multi-coloured angels the Kneeling Teppanom Angels are sold as a pair, one male and one female. The angels weigh approximately 35, 25, 10, 2 lbs each statue respectively. These angels can also be custom ordered in larger sizes. 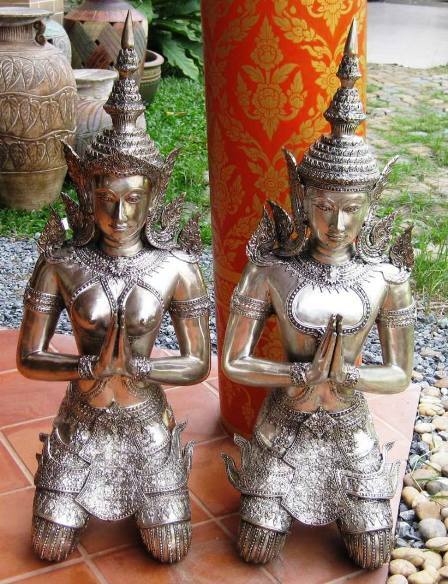 For further information about this set of Silver Teppanom Angels, please visit Nongnit's Treasures Website.